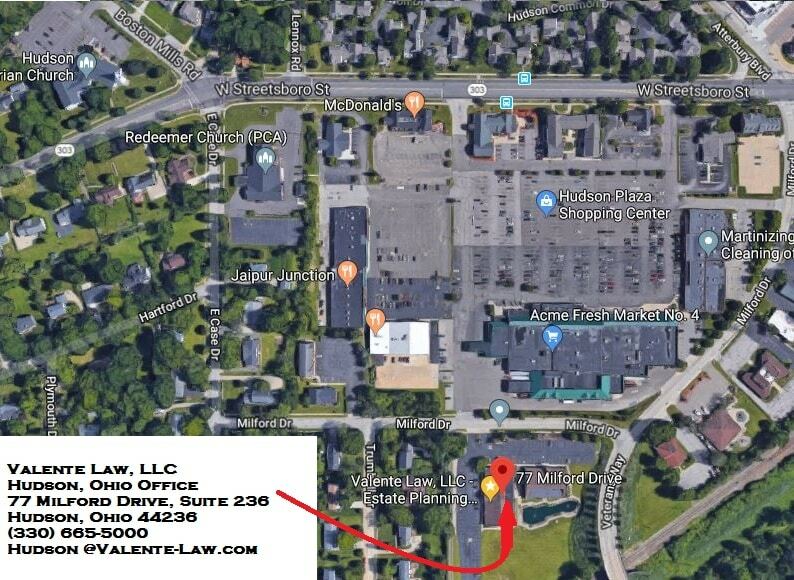 Valente Law’s Hudson, Ohio Lawyer Office is located at 77 Milford Drive, Suite 226, Hudson, Ohio 44236, can be reached at (330) 665-5000 or hudson@valente-law.com. Hudson was our first office location, and remains our main headquarters. Our office is located in a convenient location near downtown Hudson. Our Hudson office is wheelchair accessible. Hudson has been a great location for our law firm. Hudson’s demographics provide a lot of opportunity for engaging legal work. With well over 20,000 residents. The median household income of Hudson residents is over $125,000, which is over 2 times higher than the state average. There is a strong retail, commercial and small business owner presence in Hudson. Valente Law practices in estate planning, business law, real estate, and other lawyer service areas which we provide to the great residents and businesses in Hudson. Valente Law provides lawyer services relating to a number of specific areas of law. If we don’t practice the area of law you need, you can still contact us, and we will do our best to point you in the right direction. We are happy to provide even that small convenience to our Hudson neighbors, and our colleagues always appreciate the opportunity to help new clients. We offer the following legal services from our Hudson, Ohio Lawyer Office. Valente Law offers real estate services in Hudson, Ohio. This commonly includes drafting real estate documents. We regularly draft quit claim deeds, warranty deeds, limited warranty deeds, fiduciary deeds, survivorship deeds and transfer on death designations. There are many types of real estate legal documents and they all have their unique meanings. We would be happy to explain the differences between them to you. We also provide attorney services to help solve real estate disputes, and real estate law suits and litigation. Whether your neighbor is encroaching on your land, or you cannot agree on the management of the property with a co-owner, Valente Law can help you with your real estate law questions. We offer estate planning legal services from our Hudson, Ohio law office. Estate planning is important for all adults to have. Estate plans usually include a combination of wills, power of attorney authorizations, health care documents, and in many cases, one or more trusts. Estate planning is extremely important if you have children. We work with many individuals and young families planning for their first child. A revocable living trust becomes more important if there are any complexities in your family or or significant assets. A revocable trust is generally a better planning mechanism, but requires more effort and cost to set up, in comparison to a simple will. Avoiding probate, taking care of family and reducing stress and expenses are some of the considerations affecting estate planning. Through our estate planning practice, we help clients avoid probate, but when a loved one needs a probate estate, we can serve as the probate administration attorney. Probate Court is a division of the County Common Pleas Court and deals with many domestic issues. All Decedents which have property in their name without a beneficiary, need a probate estate. The probate estate process requires accounting for the decedent’s assets, paying all debts, and distributing the balance. This is a very complex process. A good probate attorney will help make the probate estate administration process much easier. If you are dealing with a probate estate, call us today to help you. Valente Law represents a number of business in Hudson and the surrounding areas. Hudson business, like all businesses in Ohio, will need to register with the Ohio Secretary of State. We assist Hudson area businesses with all aspects of their business. We help start ups forming their companies. Valente Law provides contract drafting and negotiation services. Leases, purchase agreements, non-competes, loan agreements, and many other legal documents will be used throughout the life of a business. We can help draft these documents for you. Our comprehensive business services cover the whole life cycle of businesses including planning for selling the business. Succession planning or exit planning services include designing the structure of transferring the business and preparing the business to obtain the greatest sale amount. Hudson is a city in Summit County. The Summit County Court of Common Pleas has jurisdiction on cases above $15,000 and most felonies. Stow Municipal Court has jurisdiction over amounts under $15,000 and misdemeanors. Stow municipal court has jurisdiction over Boston Heights, Boston Township, Cuyahoga Falls, Hudson, Macedonia, Munroe Falls, Northfield, Northfield Center Township, Peninsula, Reminderville, Sagamore Hills, Silver Lake, Stow, Tallmadge, Twinsburg and Twinsburg Township. The Summit County Fiscal Office has authority over real estate transfers and recording documents. Publicly recorded real estate documents for real estate in Hudson, Ohio are available through the Summit County Recorder website. The City of Hudson has a lot of good resources for businesses in Hudson on its official business page. Looking for a Hudson, Ohio Lawyer? Call us Now! Valente Law offers lawyer services in Hudson, Ohio. Our attorney services cover estate planning, probate, business, real estate, and many other areas. Please contact us today!